FLEET CHECK derives from my explorations in my local landscapes. This time it springs from the concept that tartan and landscape are one and the same. The colours represent both the actual colours of the different landscape zones codified in abstract from, and the colours from the land - ie the dyeplants that grow there. The idea of us wearing our landscape, taking our landscape with us as a cypher for where we came from is a very powerful manifestation of belonging. 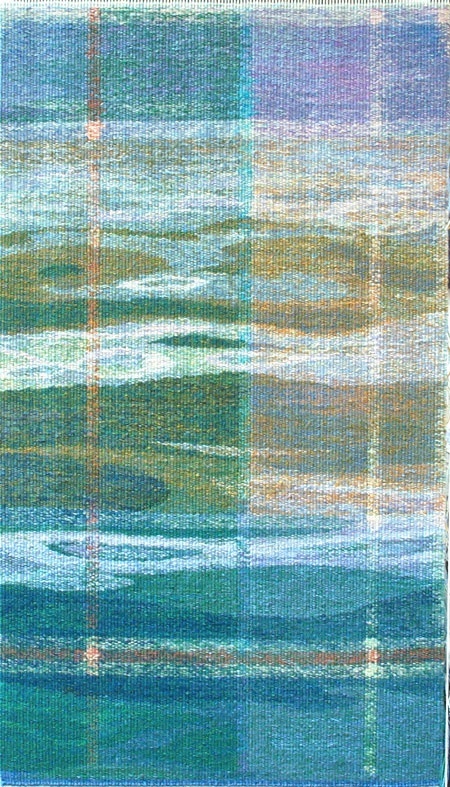 This piece uses the colours present and reflected in the waters of the Fleet estuary in early summer and has water washing over the check as the tide ebbs and flows.